One year, seven months, and one day ago I went on my first backpacking trip for my 23rd birthday. One year, seven months, and one day ago I decided to attempt a SOBO winter thru-hike of the Appalachian Trail. 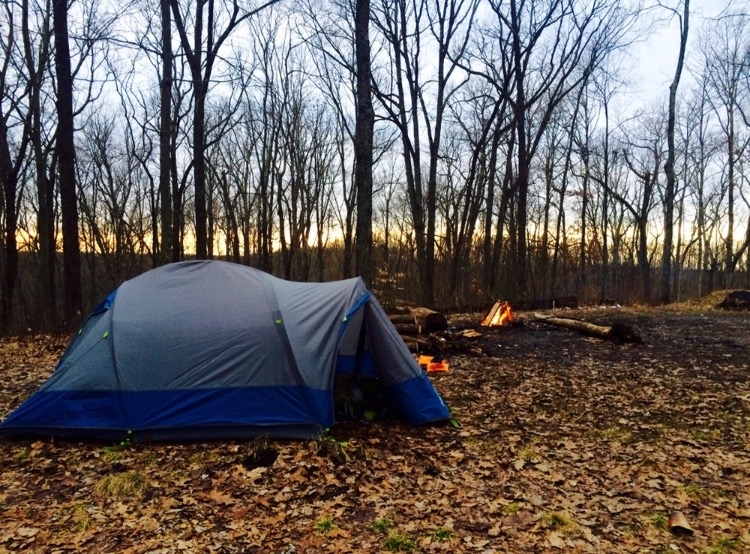 February 19, 2016 I left work and drove two hours south to Zaleski State Forest to camp/backpack for my first time ever, alone with my dog Riley, in order to celebrate my birthday a few days prior. After hiking a couple miles from the trailhead, Riley and I stopped to set up camp for the night. Maybe half an hour later, a solo hiker stopped to make camp next to us and later joined me by the fire. Conversation started the typical way, “What brings you out here?” we each asked one other. I explained how this was my first camping adventure since I was a child and very first backpacking trip. He launched into an enchanting saga about how this was his first time back on the trail since finishing his Nobo thru-hike of the AT the previous summer. I was instantly enthralled and asked every question that popped into my head over the next few hours. He explained that after initially spending one day on the trail he quit, drove home feeling like a failure only to return a week later and fully thru-hike the trail over the course of five months. His evident love and respect for the AT invoked my own dormant passion for the Blue Ridge Mountains, which I grew up frequenting as a child. Not only was my affection ignited, so was my competitive nature that I had recently locked up since retiring from sports. Growing up I was a voracious competitor and athlete primarily focused in the sport of swimming. While in high school, I traveled nationally and internationally competing on the USA swim team. In college, I swam on the Varsity Swim Team for the Ohio State University where I was eventually elected captain. After retiring from swimming, I was asked to join the Varsity Rowing team for the remainder of my fourth year and an additional fifth year. While a member of the rowing team, I earned two Big Ten titles and a National championship, as well as being a captain for that team. Being a highly competitive athlete for over 18 years took its toll on my body and I essentially decided to retire from all physically demanding sports indefinitely…until I discovered the world of long distance hiking. It wasn’t until that initial backpacking trip in Zaleski State Forest that I uncovered a hidden love for long distance backpacking. I’ve always harbored an innate pull towards being outdoors; my job with the USFWS requires I’m outside 40+ hours a week. During my downtime I hunt, fish, kayak, and do yoga all outside. Discovering new places has always been enjoyable for me, so I came to the conclusion that by traveling to those places on my own two feet would make the journey that much more rewarding. It was that night 579 days ago, after retiring to my tent on my first night backpacking, that I decided I wanted to thru-hike the Appalachian Trail. But I didn’t want to do a normal summer NOBO thru-hike, I wanted to kick it up a few notches and really make it that much more challenging. I wanted to do it in the winter, going south bound and most importantly I wanted to do it alone with only my dog as company. Finally after 579 days of waiting, planning and prepping, only thirteen days remain between us and our intended October 1st start date on Mt. Katahdin. Thirteen days separate Riley and I from our next great challenge and stepping stone in life as we trek together across thousands of miles towards Springer Mountain in Georgia. Let the countdown begin. Hey ya'll! I'm Kelly Ann and my goofy pup here is Riley. We started backpacking early in 2016 and ever since have been gearing up for some pretty strenuous thru-hikes; the first of which will be our sobo AT thru-hike beginning October, 2017. Prior to backpacking, I was a two sport varsity athlete, captain, and Conference/National Champion for Ohio State. I was also a member of the USA swim team for a couple years. My competitive background has fueled my long distance backpacking adventures to be more on the irregular side. By pushing boundaries and sharing my experiences with others, I hope to inspire more individuals to get outside and explore the world around them, whether that be by taking a stroll around a neighborhood park or walking for months on end across the country. No step is too small because all great adventures begin with the courage to take that initial step. Please keep a close eye on your pup. Not an easy walk for any dog not in the prime of his life. Good luck on your adventure. Looking forward to reading about your adventures. I live near the trail outside Unionville, NY. Our post office is a supply stop and I like to get updates from the lady there. Last week a SOBO came through. His dog sniffed a rock outcrop in the Harriman/Sterling Forest area and was bit by a copperhead. The anti-venin cost $800 which he couldn’t afford. The dog did survive but it was in bad shape. Be wary. Maybe I’ll se you at the PO. Good luck. The hikers’ parents had to drive up from Georgia to take the dog home. Other wildlife are always an issue in the backcountry. I knew this going into this hike, and will keep a constant eye on Riley. Thankfully she remains right on my heels while we hike. Thank you for the heads up, and I’m glad to hear the pup is doing well. Riley is as prime as she can be just about to turn 3 this January. I’ve never seen her tire even after pushing 25 mile days multiple days in a row. She usually sprints and plays fetch around camp at night even after all that hiking. Her safety is my utmost concern, and if I feel like she is incapable of hiking the miles and conditions we face I will take her off the trail. Make sure you have good winter gear. I am currently SOBO taking a couple of days off in Lincoln, NH. Good luck on your journey. Fair winds and following seas. Thanks for the heads up and good luck to you as well! Excited to see how your hike goes. When you get to the Smokies, me and my bloodhounds will be roaming the trail doing trail angel work. Maybe we’ll get lucky and meet you down here. Happy trails! 1. Where are you kenneling your dog before you climb Katahdin? 2. Have you researched weather conditions in the Whites at all? I’m not kenneling her; she is staying with a friend while I summit Katahdin and hike Baxter, and then she will start with me on the 2nd after the Baxter park boundary. From what I’ve seen so far, the weather is mid 60s to mid 40s at night right now. Not sure how it’ll be in a month when I’m making my way through, but that’s something I’ll worry about closer to that time. What ice axe and crampons are you bringing? Good luck and anxious to follow your trip. Its on my bucket list to hike it thru. Maybe I’ll enjoy it more in the winter, and welcome the additional challenge. To each their own. 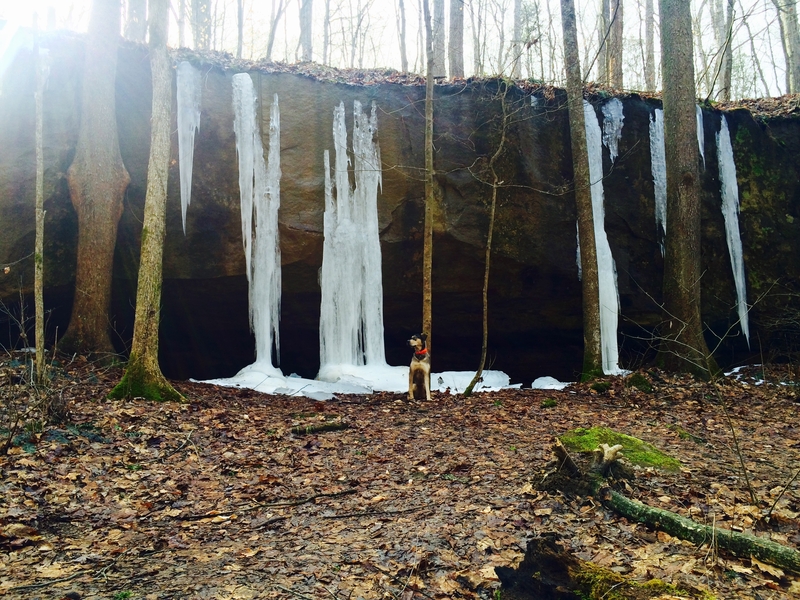 We’ve had bloggers winter hike the AT in the past, and they loved the experience. Viking completed a winter SOBO thru-hike in 2015-2016, his intro is below. The Hiking Viking had years of winter season at altitude hiking and climbing experience – and he almost died in the Whites. Grab a copy, or download from Kimble, “Barefoot Sisters Southbound”. They did the NOBO, then turned around and trekked the SOBO, sometimes in brutal winter weather. They became famous for walking barefoot much of the way, which I think is a little…no, a lot foolish. It will be hard enough properly shod. Be safe! I hope you can post a lot along the way. It would be a nice vicarious adventure for me. A physically challenged senior, I will probably never get beyond armchair dreaming about thru-hiking the AT. Absolutely connect with your adventure. I too, plan to Sobo with dog somewhere around Sep to early Oct. next year. Wish you well! Looking fwd to your future articles. I did not hike with a dog but fellow hikers did. One issue they encountered was the loss of weight halfway and towards the end. Hikers will lose all their fat but can still push on – mind over matter and you can bulk up at resupplies, etc. For dogs, it is more difficult. Our fellow hikers had to start supplementing their dog’s diet with special food. You might want a vet to check Riley mid way and for advice. Good luck on your adventure of a lifetime! Good Days and Good Nights Kelly Ann. You are incredible to be doing this! My dogs and I send you warm wishes and safe travels through these New England mountains as the colder weather begins. How are you and Riley doing? If you need anything when you’re near CT, let me know. You are welcome to spend a warm night or two in Mystic, CT with us and our 5 goldens. I would pick you up from wherever you are on the trail. Just let me know ahead of time as it’s a 2 hour drive from our home, but I’m happy to help you out. I’m a section hiker and taking a few years to do the trail. I recently retired from teaching, so now I can hike more. Be careful and safe. That is so incredibly nice of you Elle! I’ll be sure you mark that on my log so I can let you know when we’ll be in the area! Can’t wait to have a puppy play date!